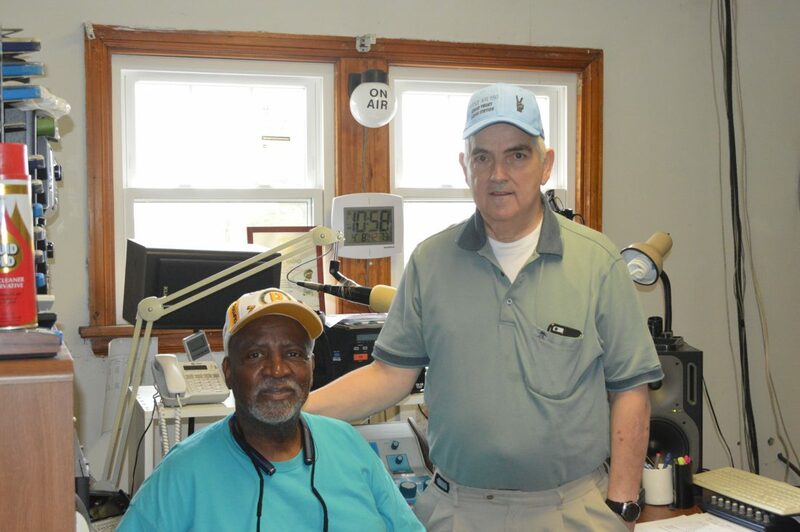 ON THE AIR — Longtime disc jockey, Iko Culbreath, seated, and new station owner Bob Scharnhorst, were in the on air studio of Steubenville’s WIXZ-AM. The station changed hands Dec. 4. STEUBENVILLE — A longtime radio voice in the city has a new owner, new call letters and a new format. The former WDIG-AM officially changed to WIXZ-AM, pronounced “Whick-see,” on Dec. 4 after it was purchased by Bob Scharnhorst. It can be found at 950 on the AM dial. Scharnhorst said he has spent most of his adult life working in the radio field, adding his first job was with the now-defunct WIXZ in McKeesport, Pa.
“I saw the (WIXZ) call letters were available and I thought, wouldn’t that be neat (to come full circle)?” he said. Scharnhorst said one of the first things he did when he bought the station was research the area demographics, and using that information, he decided his next change was to switch to an “oldies” format. The station, which is on the air 24 hour a day, uses satellite programming on weekdays, but is live on weekends. Iko Culbreath, who has been a disc jockey since 1963 and at the station since 1993, is one of those weekend voices. Another show that will stay the same is the Sunday morning religious program. Scharnhorst said he really wants the station to be become a community broadcaster that does things with and for area residents. Some of his ideas include holding a Steubenville Day at Kennywood, having car cruises and a call-in trade-and-sell-type show. He also hopes to get a full-time news person. WIXZ went on the air in 1973 as WLIT. Steubenville’s other AM station, WSTV, served the area from Nov. 4, 1940, until it went silent on Dec. 5, 2011. Scharnhorst said he wants to make his station a force in the valley. “I want to get us discovered,” he said.